"This project was created to make a visual representation of a space that is very much one-dimensional, a metaphysical universe. 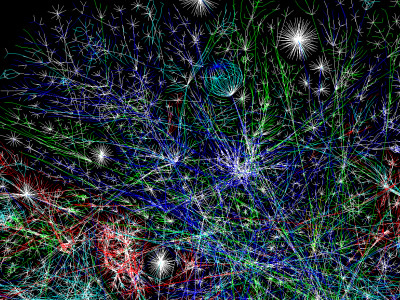 The data represented and collected here serves a multitude of purposes: Modeling the Internet, analyzing wasted IP space, IP space distribution, detecting the result of natural disasters, weather, war, and esthetics/art. The goal is to use a single computer and a single Internet connection to map the location of every single class C network on the Internet. 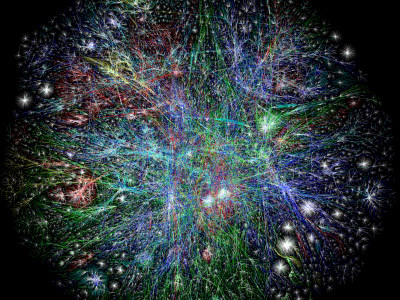 It is obvious that the Internet is not routed as a bunch of class-c networks, but it is easy to see that by treating the Internet IP space as a bunch of class C networks, it will be possible to make a detailed map of the entire Internet. In reality, the address space has been allocated in fairly large contiguous blocks, which renders strictly optimal utilization difficult. The smallest block that is logically routed via BGP or allocated by ARIN is a class C network (CIDR /24.)"